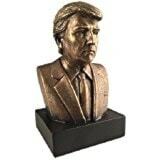 President Donald Trump Bronze Bust Measures 6 inches tall. Made of polyresin. Gift Boxed.